Just as Google gears up to create their own smartwachtes, China's search giant Baidu is breaking into the wearable devices market, with what appears to be software made to run on smartwatches. The company behind China’s largest search engine published a new wearable devices website. 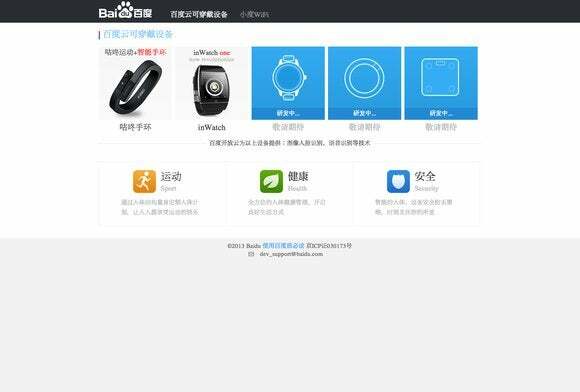 It shows two products, a health monitoring wristband and a smartwatch, equipped to run the search giant’s mobile platform, Baidu Cloud. Baidu Cloud will power face and speech recognition technology on the devices, according to the website, which also hinted that a weighing scale and another smartwatch were also in the works. The company would only confirm that it is developing a wearable device, but declined to offer more information. Both hardware products listed on the website come from third-party vendors in China. Codoon is the maker behind the wristband, while the smartwatch comes from a company called Shenzhen inWatch. None of the devices, however, appear to be on sale. Like many companies, Baidu is investing more in expanding its presence in mobile products. In the past, it has partnered with many smartphone vendors in the country to pre-install its search bar on most handsets sold in China. In 2011, the company also worked with Dell to release the first of several phones built with what would become Baidu Cloud. The platform offers a suite of mobile services from the search giant, similar to the way some functions on the Android OS are tied to Google. But since then, only a few hardware vendors have released phones pre-installed with the software. Baidu has largely stayed away from selling its own hardware. However, the company plans to start launching Wi-Fi dongle and routing devices to help users connect to wireless networks. In addition, the company has come out with a dongle that can stream Internet video from mobile devices and PCs to a television screen. Earlier this year, Baidu said it was also developing its own Google Glass-like device, but the company has yet to decide whether to release it commercially.